AXi is our latest innovation – a steady rest with a built in cylinder in its middle arm. 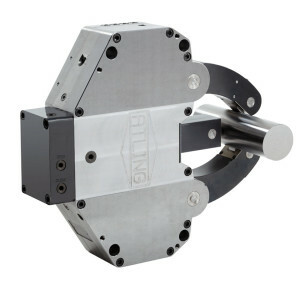 With this type of cylinder we can make the steady rest even smaller and open up for the possibility of fitting a larger gripping range steady in the machine. The AXI steady rest is a member of the same family as AXE, and have mostly the same components as Housing, Cover, Arms e t c.
With the help of a pressure booster we compensate for the smaller piston area and let the user get the same amount of gripping force as the standard AXE steady rest when using the same hydraulic pressure. AXI is available from size AX4I and can be equipped with the swing away feature, just as the standard AXE series.